The military startegy, warriors, weapons and history of ancient times. Note: This list may be slightly skewed towards Western culture, not on purpose though! Note Two: The Famous Persons Institute has substituted Johnny Cash in for the 100th most famous person ever instead of the Chandra Gupta I, founder of the Gupta Empire of India due to gross negligence and respect for early 90’s Johnny Cash music. Note Three: Recent (living) figures such as Clinton or Bush haven’t been added because we don’t have enough historical perspective to judge their long term fame prospects. If you are not on this list this could be the reason. This entry was posted in Greatest & Worst in History and tagged fame, famous, famous in history, history, History's most famous people, history's most famous persons, historys most famous, list, list of history's most famous people, Most Famous Person in History, people. Bookmark the permalink. Why isn’t Michael Jackson on this list? The basic reason is because entertainers fame doesn’t seem to last long in history and this is the list of the most famous in history. MJ has been hugely popular for 30 years, while someone like Emperor Qin has been famous for 2000 years. That being said he may have more lasting star power because he was so big, so iconic and so weird. I’m going to place him in slot #90 and remove Billy the Kid. He is on the list Dumb Asses!!! Why isn’t Nostradomus on this list? oops. see him, never mind. I can’t tell if the people saying MJ isn’t on the list are stupid or trolling. I skimmed this list however when I took a further look I could not help laugh when i saw Johnny Cash as 100…. Classic. if you have to put (not the singer) on “Lenin” than apparently he’s not that famous to start with. Actually Jinnah wasn’t on the list because I had never heard of him, has nothing to do with his religion. Many countries have founders, I just don’t know about them because I’m from the West and the list has a bias since I don’t know the most famous people in all cultures. I attempted to compensate for that but the futuristic software AncientMilitaryHistory.com developed to calculate world fame also suffered from a Western view point. Where would you propose that Jinnah goes? You go to rural provinces in Africa, Asia or South America, nobody there knows Babe Ruth or Johnny Cash. But they all know who Bruce Lee was, or who Pele is. For me, top 5 most famous / iconic figures of recent times: Michael Jackson, Pele, Bruce Lee, Sylvester Stallone (for his Rocky & Rambo roles) & Muhammad Ali. One would also add Superman & Mickey Mouse if they had passports. No, he deserves much more, same for Martin Luther King Jr., Frederick the Great and da Vinci. Are you sure Moses exists? Michelangelo Buonarotti IT WAS A FU***** PAINTER, who cares? Cài Lún (credited as inventor of paper) THIS GUY CREATED THE PAPER! 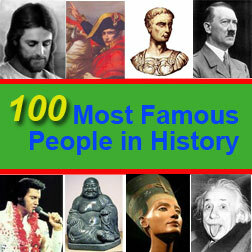 is it 100 most famous people in the world or “100 most famous people in europe”? This is actually bias towards Western history. The reason for that is that the panel of the Greatest in Historology was formed from a single Western country. Do you have any suggestions that should have made the list? Jesus is know in both the Koran and Bible. PBUH is not in the bible.